Q.1 What are Deemed Exports? Q.2 When refund application by Recipient of Deemed Exports can be filed? Q.3 What are the relied upon documents which I have to upload with GST refund application of Recipient of deemed export? Q.4 To whom should I file my GST Refund application with? 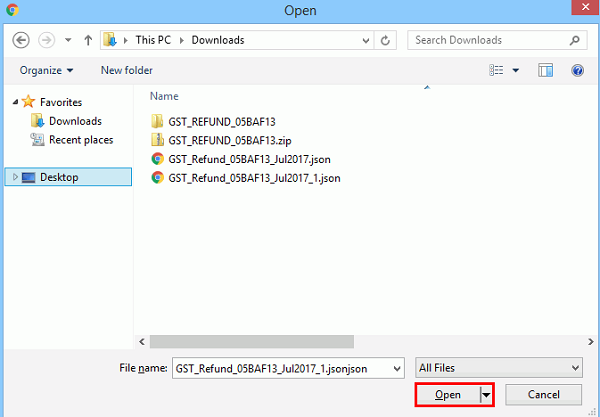 Q.5 Can I file for multiple tax period in one GST refund application? Q.6 Can I file nil refund for multiple tax period in one refund application? Q.7 Can nil period of refund be combined with the period in which there is refund in one application? Q.8 Can I save application for refund? Q.12 What is the significance of VALIDATE STATEMENT button on the GST Portal? Q.13 Can I update/ edit data after clicking the VALIDATE STATEMENT button? Q.14 What is the purpose of Download Unique/ Valid Invoices? Q.15 What is the purpose of Download Invalid Invoices? Q.16 I am getting a message “validated with error” while validating statement on the GST Portal. What do I do? Q.17 I have uploaded statement which has been validated on the GST Portal. I need to upload a new statement of invoices again. What do I do? Q.18 I am getting error that “Future date is not allowed for Invoice Document” while uploading statement on the GST Portal using the offline utility even if I am providing correct invoice dates. Why? Q.20 How can I track the status of application for refund? Q.22 Where can I download my filed refund application? Q.23 What happens when refund application is filed? Q.24 Whether there is any ledger entry on filing refund application? Q.25 When / how will the refund Form RFD-01A be processed? Such goods are manufactured in India. Ans: If the recipient of deemed exports has paid the tax amount on inward supplies received which is qualified as deemed exports and have taken credit of tax paid in their Electronic Credit Ledger, then the recipient of deemed exports can claim refund of tax amount paid by them, which has been posted as input tax credit in their Electronic Credit Ledger, by providing the declaration that the supplier has neither claimed nor shall claim any refund with respect to the said supplies. Ans: You have to upload documents as are required to be filed along with Form RFD-01A, as notified under CGST Rules or Circulars issued in the matter and other such documents as the refund sanctioning authority may require. Statement 5B shall be uploaded mandatorily with the details of invoices for which refund is to be claimed. Taxpayers have an option to upload upto 4 documents with the refund application, of size up to 5MB each. Therefore, any supporting document can be uploaded by the taxpayer, if required. Ans: The taxpayer shall file the refund application in Form RFD-01A on GST portal. Taxpayer shall choose ground of refund as Recipient of Deemed Exports” for claiming refund. After filing, refund application shall be assigned to Refund Processing Officer and applicant can track the status of refund application on GST Portal. E.g. If taxpayer doesn’t want to claim refund of Apr 2018, May 2018 and June 2018 as he doesn’t have any invoices for this period, then taxpayer can choose the period from Apr 2018 to June 2018 and file a nil refund application for that period. Note: After filing nil refund application, taxpayer won’t be able to file refund application for that period in future. Ans: No. Upload of Statement 5B with details of invoices is mandatory for filing refund application. The statement uploaded by taxpayer would be validated with the details regarding subject supply declared by the supplier of deemed exports in their Form GSTR-1 filed for the relevant period. This information will be validated when the taxpayer uploads this statement while filing refund application on the GST Portal. On successful validation, the claim can be filed by such person. Navigate to Services > Refunds > Application for Refund > Select the refund type as “Recipient of Deemed Exports” > RefundApplication > Download Offline Utility link. Ans: Validate Statement button is used to validate invoice data provided by the taxpayer. The details of invoices would be validated from the details provided by supplier of deemed exports while filing their Form GSTR-1. Ans: To download the invoices that have been uploaded successfully on the GST Portal, you can click on the hyperlink “Download Unique Invoices” before you click the Validate Statement button. After clicking the statement, the label of the button changes to Download Valid Invoices and you can download validated invoices by clicking on it. Ans: To download the invoices that have not been validated successfully along with error details on the GST Portal, you can click on the hyperlink “Download Invalid Invoices”. Ans: For offline utilities, there is no server date available and hence the utility will have to depend on local system date for validation. In case your system has incorrect date, such issues can come. User should correct local system date of their machine. Ans: Yes, there is debit ledger entry in Electronic Credit Ledger on filing refund application equivalent to the amount of refund claimed. How can I file application for refund as a recipient of deemed export? 3. 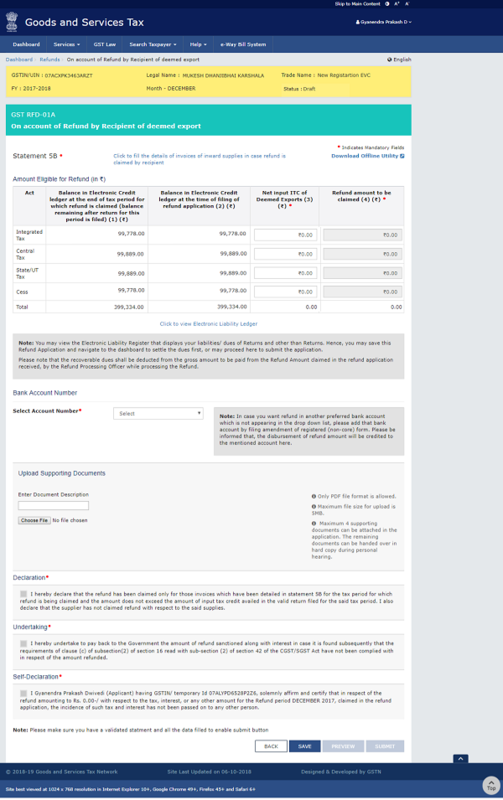 The Select the refund type page is displayed. Select the On account of Refund by Recipient of deemed export option. 7. Select Yes if you want to file a nil refund. Or else, select No. 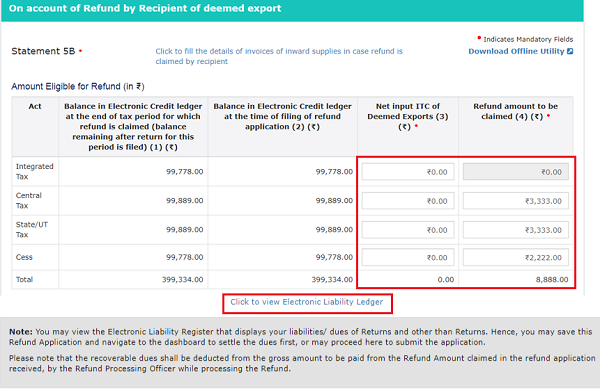 The On account of Refund by Recipient of deemed export page is displayed. 8. First you need to download the offline utility, upload details of invoices of inward supplies received and then file refund as a recipient of deemed export. 13. Once the template is downloaded, you need to enter the invoice details for which refund has to be claimed. Enter the GSTIN and “From Return Period” and “To Return Period” in mmyyyy format for which refund is to be claimed. 14. Enter the Sr. No., details of invoices of inward supplies and details of tax paid. 15. Click the Validate & Calculate button to validate the statement for errors and calculate the Total Taxable value and Total tax. 17.2. Click the Validate & Calculate button to validate the statement for errors and calculate the Total Taxable value and Total tax. 21. A success message is displayed that file is created and you can now proceed to upload the file on the GST Portal. Click the OK button. 22. Click the link Click to fill the details of invoices of inward supplies in case refund is claimed by recipient. 23. Click the CLICK HERE TO UPLOAD button. 24. Browse the location where you saved the JSON file. Select the file and click the Open button. 25.2. Unique invoices that has been uploaded successfully are displayed. 29.2 Invalid invoice excel sheet is downloaded on your machine. Open the invalid invoice excel sheet. Error details are displayed. 31. In the Table Net Input ITC of Deemed Exports and Refund Amount to be Claimed, enter the amount of net ITC of deemed exports and refund to be claimed. 32. You can click the hyperlink Click to view Electronic Liability Ledger to view details of Electronic Liability Ledger that displays your liabilities/ dues of Returns and other than Returns. 36. Click the SAVE button. 1. To view your saved application, navigate to Services > Refunds > My Saved/Filed Application command. 2. Application can be saved at any stage of completion for a maximum time period of 15 days from the date of creation of refund application. If the same is not filed within 15 days, the saved draft will be purged from the GST database. 37. Click the PREVIEW button to download the form in PDF format. 38. Form is downloaded in the PDF format. 39. Select the Declaration and Undertaking checkbox. 40. Click the SUBMIT button. 41. A confirmation message is displayed that “Statement submitted successfully.” Click the PROCEED button. 42. Select the Declaration checkbox. 43. In the Name of Authorized Signatory drop-down list, select the name of authorized signatory. 44. Click the FILE WITH DSC or FILE WITH EVC button. 45. The success message is displayed and status is changed to Submitted.Application Reference Number (ARN)receipt is downloaded and ARN is sent on your e-mail address and mobile phone number. Click the PDF to open the receipt. 46. ARN receipt is displayed.